Mumbai, February 16: Pharmaceutical giant Zydus Cadila and another firm Macleods Pharma suspended Kashmiri employees who worked as executives for posting insensitive and "anti-national" messages on social media regarding the Pulwama Terror Attack. The employees reportedly put up posts praising terrorist organisation Jaish-e-Mohammad. On Thursday, an SUV laden with heavy amounts of explosives rammed into a vehicle part of the CRPF convoy and martyred 40 Indian CRPF men. Jaish-e-Mohammad claimed responsibility for the attack. NDTV Suspends Deputy News Editor For Insensitive Facebook Post on Pulwama Terror Attack, Condemns Employee's Action. Both the companies have also issued a show cause notice to the employees to explain why they posted such messages. The notice said that if they fail to explain their position to do not show up within the stipulated time, their services will be terminated. AMU Student Posts Objectionable Tweet Praising Jaish-e-Mohammad After Pulwama Terror Attack, Suspended by University. Macleods Pharma, in its letter to the Srinagar based employee in question, wrote that, "In respect of the severe terrorist attack on our security forces at Pulwama, J&K state….. You have posted an anti-national message on your Facebook account of social Media as under: ‘Athh wanaan surgical strike’ meaning thereby- ‘This is called surgical strike." Pulwama Terror Attack: All Party Meeting in Parliament Library at 11 AM Today. In a similar incident on Friday, News channel NDTV- New Delhi Television Network, has condemned a post put up by one of its digital deputy news editor on the Pulwama terror attack and has suspended the employee in question. The company has also said that it is weighing further action against the employee. The news editor in question wrote the post on her personal Facebook page, said the statement. 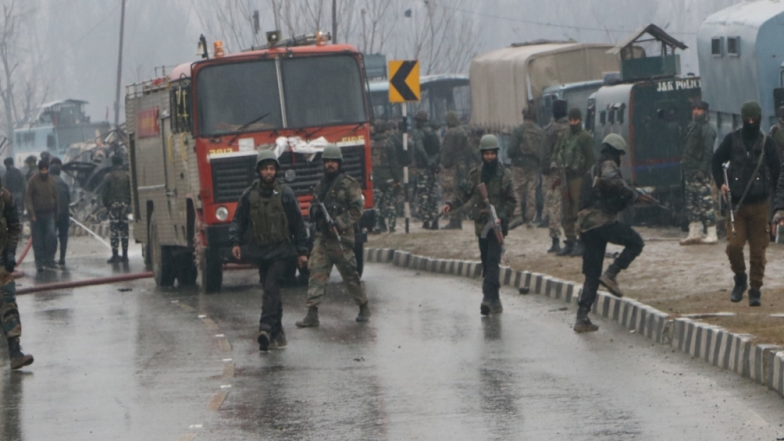 On Thursday, a bus carrying over 40 CRPF jawans, which was part of a convoy of 78 vehicles with 2,547 CRPF personnel moving from Jammu to Srinagar, was attacked by an SUV laden with explosives in Pulwama, Awantipora area. The dastardly attack martyred 40 CRPF jawans and seriously injured over a dozen jawans. Jaish-e-Mohammad claimed the responsibility for the terror attack and identified a 20-year-old Pulwama local turned suicide bomber Adil Ahmed Dar responsible for the Fidayeen style attack.